The village of Hebballi in the Krishna river basin is a striking example of a successful and sustainable piped water supply in rural India. While challenges still remain, this experience shows that some steps towards equity and sustainability can be taken in many other places too. S Vishwanath reports. Rural domestic water supply schemes in Karnataka are plagued by the usual ills and well-known deficiencies: dependence on ground water sources and hence lack of source sustainability; poor quality of electricity, which hampers water pumping; wastage from overflowing cisterns; bad quality of construction work; lack of institutional responsibility, especially for management of water; lack of a legal framework; etc. With the problems so wide-ranging, one struggles to find a success story in most parts of the state. And when one finds it, it's worth dwelling on its lessons. 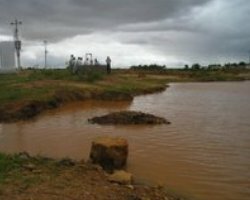 The village of Hebballi in Hosadurga Taluka of Chitradurga district, in the Krishna river basin is a striking example of a successful and sustainable piped water supply in rural India. Hebballi village is part of the Gram Panchayat of Hebballi, comprising six other smaller habitations. Until recently, it too had the usual problems of a dysfunctional water system based on community connections from an overhead tank. Most of the time this system did not work for want of maintenance. Water was available infrequently, and usually only for about two hours every day. Disputes, some leading to fights, were regular at the water point and the situation became worse in summer. A lot of this has been dramatically changed, following a total rehabilitation of the water system that was attempted under a Danish International Development Assistance (DANIDA) project; indeed, while some challenges still remain, there are also important positive lessons from this change that we could apply elsewhere. Institutionally, and does it have democratic accountability? Socially, and does it take care of the poor and disempowered and provide access to all? Technically, and can it be managed and fixed locally by the institution in charge? Financially, and can it recover at least its Operating and Maintenance costs, plus add a little each month to a sinking fund? Ecologically, and can the source provide good quantity and quality water for a substantial period, say, at least 20 years? In Hebballi, the village water supply and sanitation committee (VWSSC) under the Gram Panchayat is responsible for the system. This is true for the entire state of Karnataka, but works as envisioned in very few places. Members of the VWSSC are elected on an annual basis by all the villagers. The accounts are submitted on a monthly basis to the Gram Panchayat and are audited under the Gram Panchayat system. Democratic accountability and specific job responsibility for water and sanitation has been ensured. There are 236 houses and families in the village. One hundred and forty five families are recognized as Below Poverty Line (BPL) families, and have identification cards to this effect. One hundred and eighty five 185 individual water connections have been given so far, and 5 common taps cater to the rest of the households. There is access to the piped water supply to all. Special care has been taken of the Dalit families in the village by waiving connection charges, providing group connections and ensuring timely release of the same quality and quantity of water to them as to everybody else. Existing bore wells with hand pumps continue to be available, and provide water for those who need it free. These are also maintained in good condition by the VWSSC. The source is underground water. It should be remembered that more than 92 per cent of the habitations in Karnataka source their water from bore wells. Two bore wells provide water to an overhead tank of 56,500 litres capacity. The bore wells have a 7.5 hp pump and an electrical system with a separate transformer has emerged to ensure adequate and high quality power when required. Distribution is then by gravity. The entire system is managed by one pump operator who has the requisite technical skills to trouble-shoot minor maintenance issues. One of the source bore wells has a recharge tank created next to it. Every connection is metered; the meters themselves were made available through an innovative process of the VWSSC taking up a dealership for the meters, and then accessing them this way, thus reducing the cost of the metres. It took six months for the entire infrastructure to be built by the contractor. Assistance from DANIDA helped the project substantially. Eighty five per cent of the project capital costs came from DANIDA, another 10 per cent was the people's contribution, and the remaining five per cent was provided by the Gram Panchayat. The estimated cost of the project was Rs.12.5 lakhs, but the actual incurred cost turned out to be Rs.17 lakhs. The works were contracted out to a local contractor; however purchase of the material and construction supervision was done by the VWSSC closely. One challenge that remains to be addressed, is that the embargo on agricultural use near the influence zone of the drinking water source is not legally enforceable, nor is there a social construct to prevent overuse. A connection charge of Rs.650 was collected during the initial phase of the project. New connections now incur a charge of Rs.850; this is levied by the VWSSC. This essentially is for the meter and the chamber which houses it securely, as well as for drawing one power line to the household from the main line. One connection per meter is ensured and the terms of the connection are explained on a card given to each family. Water tariff is fixed at Rs.30 for the first 8 kilo litres, and Rs.5 per kilo-litre for additional consumption every month. Bills are provided at the end of every month regularly, and payment is collected within the next 10 days. The largest expenditure item on the O&M side is the power bill, which is easily covered by the revenues generated. Besides this, staff salary is the only recurring cost. In 30 months since the project commenced, a small sinking fund of Rs.30,000 has been created from the revenues. Source sustainability is crucial to the continuance of any water supply scheme. Particularly in Karnataka, there is a striking dependence on ground water - and especially deep ground water - for domestic water supply. Overdrawing of a weak hard rock aquifer, especially by competing agricultural demand, and inattention to adequate recharge results in the drying up of bore wells. The redundancy of many rural drinking water supply schemes is thus inevitable. The state is now proposing to shift away from this approach, with an avowed policy of preferring surface water sources. 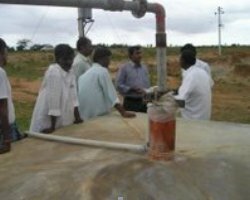 In Hebballi two bore wells supply the domestic water requirements. The depth of one bore well is 400 feet, although water has been struck at 180 feet. A huge impounding tank has been built near one of the bore wells, from a very large catchment. It appears that this would provide more than adequate storage and recharge potential for the entire requirement drawn for domestic purpose. There is no immediate competing demand, through agricultural pump sets are nearby. The effort made by the villagers for ensuring the recharge of water is substantial. Only 80 houses have toilets out of 236. 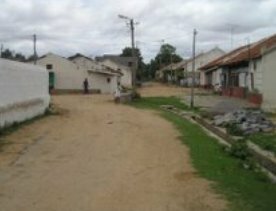 Waste water streams in the village still remain unaddressed. The recharge of the bore well does not work for hydro-geological reasons. Although the VWSSC made the effort and created the recharge structure, the presence of sheet rock just below the surface prevents deep percolation. If the VWSSC had taken the assistance of a professional hydro-geologist, a better recharge structure may have been created. The embargo on agricultural use near the influence zone of the drinking water source is not legally enforceable, nor is there a social construct to prevent overuse. The general agricultural scenario is bleak. There is rampant drilling of bore wells to support the areca nut crop. In spite of watershed initiatives in the area demand management is virtually non-existent. Rural drinking water supply will continue to be faced with many challenges. What Hebballi's story so far tells us is that a beginning towards sustainability can be made in many locations, since a lot can be done socially and collectively, to ensure both equitable access and economic viability. S Vishwananth works with the Rainwater Club (www.rainwaterclub.org), and is interested in sustainable water management practices, including rainwater harvesting and ecological sanitation.